When it comes to replacing a full arch of missing teeth, you shouldn’t have to wait. Dr. Sarah Roberts is pleased to offer the most preferred and advanced solution in modern restorative dentistry. In a single day, patients can attain a secure and beautiful set of teeth using the All-on-4 treatment concept. Not only is this unique implant-supported denture system ranked superior in patient satisfaction, it is also less invasive and much quicker than traditional overdentures. The All-on-4® treatment concept involves a minimally invasive oral surgery to place as few as four implants to secure a fixed full-arch restoration of prosthetic teeth. Using a strategic angled placement of the All-on-4 implants, less overall bone structure is required to stabilize the implants. This is ideal for patients who want to avoid a longer recovery or who would otherwise need bone grafting to support dental implants. 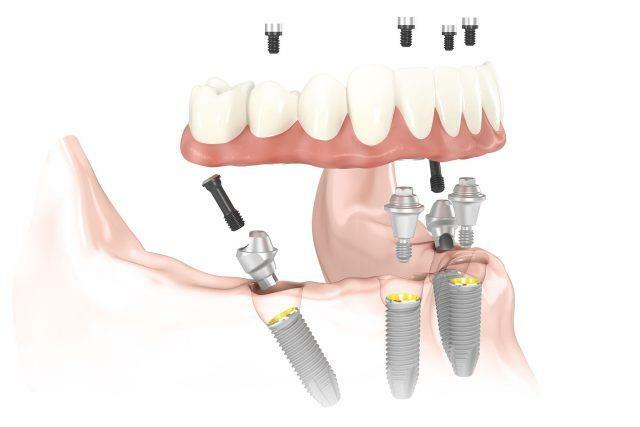 The highlighted advantage of choosing the All-on-4 system is that patients can walk away from their implant surgery with a set of strong, natural-looking teeth until the final restoration is ready to be placed. Whether you have a full mouth of missing teeth or want a more stable alternative for your ill-fitting dentures, “teeth-in-a-day” can be an excellent solution. Using cutting-edge technology and a multidisciplinary approach, your same day teeth can be crafted with the level of precision and quality you deserve from your new smile. Dr. Roberts works closely with a skilled oral surgeon and lab technician to streamline the entire process. Initial Visit – The process begins with a thorough consultation and exam. During this visit, we will discuss your medical and dental history as well as perform an advanced CT scan of your mouth to confirm your candidacy. Impressions – In a matter of minutes, we can take impressions of your mouth to ensure we can provide ideal results for your final replacement teeth. Imaging and Surgical Planning – Modern 3D images are used to give us an exact depiction of your jawbone, sinuses, and nerves. We will use these images to gather precise measurements and plan for your implant placement. Digital Simulation – Using advanced computer software and imaging, we can simulate a virtual model of your implant-dentures, which helps us determine the best position for the implants and whether four or six implants should be used. Implant Surgery – Depending on your needs, the oral surgery can include multiple procedures such as extractions, bone shaping and implant placement. This is performed under local anesthetic as well as sedation dentistry for a painless experience. Replacement Teeth – Your temporary replacement teeth (denture) will be secured to the dental implants immediately after surgery. 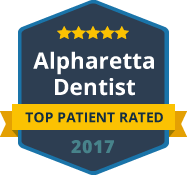 You’ll leave our Alpharetta office with the beautiful and confident smile you deserve. Healthy and Natural-looking Smile – The meticulous planning and careful placement of your implants delivers a new smile that is not only beautiful but immediately functional as well. Patients are able to regain confidence in eating and speaking using the All-on-4 dentures. Lastly, by securing your replacement teeth to dental implants, you can avoid the progression of jawbone loss or shrinkage that occurs when teeth go missing. Routine Checkups – In most cases, we will ask you to return to the office about two weeks after your implant surgery. At this visit, we will monitor your healing progress and evaluate the stability and health of the implants. Implant Healing – During the subsequent three to four months after surgery, your titanium implants will heal and fuse to the surrounding bone. This forms an artificial tooth root that strongly anchors your prosthetic teeth. During this healing phase, it is important to avoid certain foods that may cause extra force or stress on the implants. Permanent Teeth – Once your permanent teeth are ready, we will remove the temporary teeth and attach your permanent dentures to your implants. This is typically a painless and quick office visit that completes your restorative treatment plan. Want to learn more about Teeth-in-a-Day from a talented Alpharetta dentist? 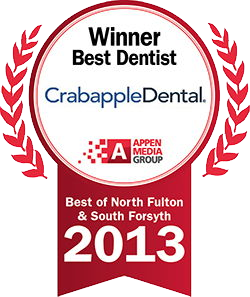 Contact Crabapple Dental today to schedule your consultation with Dr. Sarah Roberts. We are where modern dentistry and compassionate patient care come together to create brighter smiles.